Do you love walking but only have a day on your holidays to try it out? 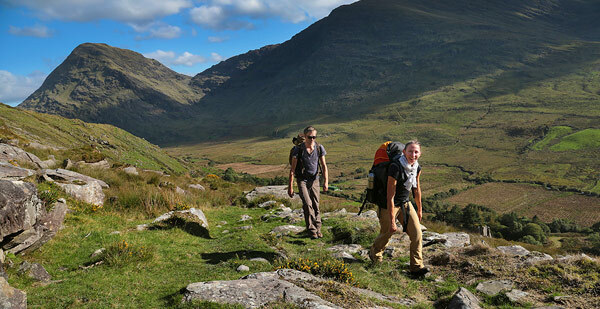 Do you want to go off the beaten path and discover some of the best coastal, national park and valley walks in Ireland? 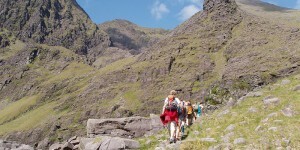 Let Go Visit Ireland guide you on some of the most spectacular day walks that Kerry has to offer. Kerry is justly deemed a walker’s paradise. The Iveragh Peninsula contains the best – from Killarney’s renowned Lakeland to the MacGillycuddy’s Reeks, Ireland’s highest mountain range to the spectacular coastline well known to those who have travelled the Ring of Kerry. Your enjoyment is ensured as you walk through dramatic scenery – high peaks and valleys carved in the Ice Ages, lakes and bays and views of the broad Atlantic Ocean. A range of wildlife enhances the experience. The Killarney National Park is home to the only pure herd of Irish Red Deer. Throughout the peninsula there is rare flora and fauna and the experienced bird watcher will have adequate scope for observation. You can take a walk through history along the Kerry Way, Ireland’s premier waymarked trail that has a backbone of old coaching routes and butter roads. Some of the lines may go back to pre-history and mythology permeates the very landscape. The slopes of Drung Hill give spectacular views over Dingle Bay and are steeped in history – and pre-history. Did our early ancestors walk this way, a line subsequently adopted as an early Christian route and later as a medieval coaching road? To copper-fasten the experience, there can be detours to view archaeological artefacts and 4,000-year-old rock art. The day can be further enhanced by a possible diversion to Rossbeigh beach for a swim in waves of the Atlantic Ocean. You walk from the seaside village of Glenbeigh, ascending gradually to circle Seefin Mountain (“seat of Fionn”). Views over Dingle Bay and Lough Caragh reward you and give scope to the photographer. Stroll downwards into the lush valley of the Caragh River in storied Glencar. Blackstones Bridge could be the ideal luncheon spot before continuing through Drombrane Wood and along the banks of the Caragh River to finish with the opportunity for refreshment at the Climbers Inn. 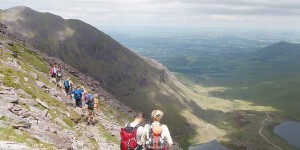 Climb Carrauntoohill, Irelands majestic highest mountain (1039m), with spectacular views over the southwest and as far north as Galway Bay. There are a number of routes on and off the hill; all giving spectacular views over the Peninsula and possibly as far north as Galway Bay. The challenge is there. A reasonable level of fitness is required. This leg of the Kerry Way is all within Killarney National Park, habitat of the only pure herd of Irish Red Deer. Starting in the ancient oak woods of Derrycunnihy, you can walk the line of the Old Kenmare Road, regarded in medieval times as the most westerly route in the world! Cores Cascade could be the ideal lunch stop in the moor/bogland beneath Mangerton and Torc mountains. Views and opportunities for photographs continue on the descent beside the spectacular Torc Cascade and the stroll by Muckross Lake into the gardens of Muckross House (19th century mansion), with its welcoming teashop. There is the option of extending the walk to visit to the ruins of Muckross Friary (15th century). Go on a wonderful open topped boat trip through the three Lakes of Killarney from Ross Castle to Lord Brandons Cottage and walk through the dramatic, ice-carved Gap of Dunloe. Walks and guides are arranged on request. Please contact us today.